This is from a book Lace for Children of All Ages, and is my first attempt at something other than bookmarks or edgings. OK, it's full of mistakes, but I'm pleased with it, and plan to try another one, a little more complicated, very soon! Oh, Snowy. This is beautiful! I doubt that I will ever be brave enough to try bobbin lace, but I sure do love it. Snowy, I agree with Laura... your heart is beautiful! Some day I'll get brave and try bobbin lace, but for now, I'll stick to tatting! 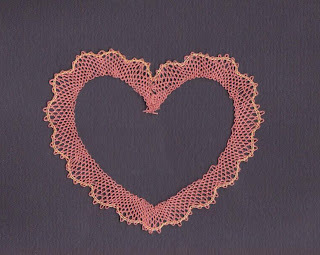 Your bobbin lace heart is lovely. My lace guild gave me a lovely antique french lace pillow (with the tape wheel on it) and some danish bobbins. The lace pillow is in severe disrepair and needs to be recovered and I have no idea how to do that. I want to learn sometime. I will have to look for that book. I think it looks like it has good patterns, so far! C'est magnifique! I am still waiting for my bobbin lace kit from Lace Maker among some thread also ordered. Please continue to show your work in both tatting and bobbin lace. Snowy it looks wonderful to me. Lace work is always something I have wanted to try. 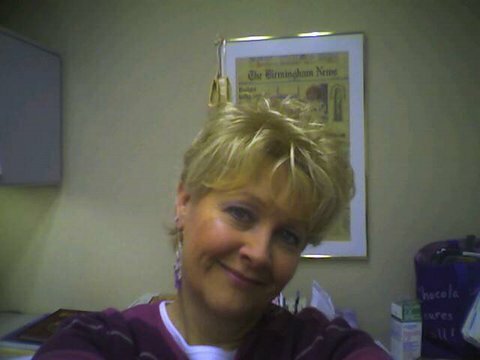 Hi Snowy, thanks for the fabulous info you gave me on my blog for bobbin lacing. I would appreciate any advice you had to give me. I will have to email you a photo of my poor roller lace pillow in it's sad state of affairs so you can help me. I have spangled bobbins one day in the lace guild a member taught us. Perhaps we can exchange email addresses some time, if you would like. Thank you all for the complements! My second heart is not going well at all, and I will show the non-progress tomorrow. Diane, I'm sure you would be ok as it's a lot like weaving which you already do...sometimes I wish we all lived a lot nearer, we could have a meeting from time to time. I know there's a lot I could learn if we did! Hé bien je ne sais si tu le réalises seule, mais ce n'est pas le plus simple, alors bravo!!!! !